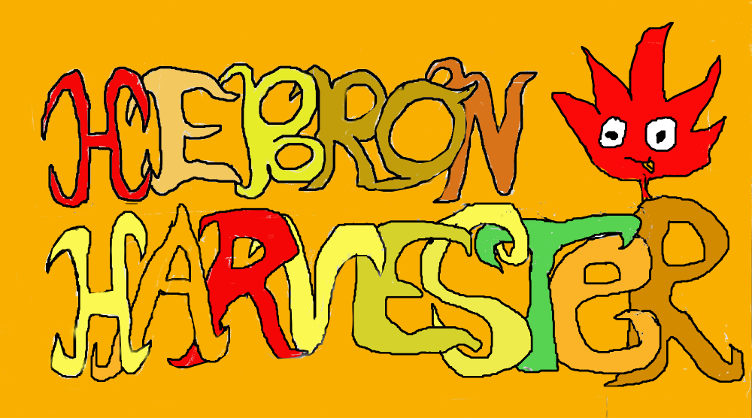 The Hebron Harvester: Hebron Town Center Project Looking to Put "Feet on the Street"
Hebron Town Center Project Looking to Put "Feet on the Street"
The Hebron Town Center Project formed in order to bring more entertainment, socialization, and integration into our beloved town of Hebron, Connecticut. When the committee first met at the Douglas Library, it was opened up to the population to bring their ideas to promote more activity in Hebron. The committee talked about what was working and what wasn't working in Hebron, and opened up to suggestions on how the town could improve, what events it could offer to keep more people in town, and how to utilize the town green in the center of town. At the last Hebron Day, this past August, the Town Center Project hosted a survey asking residents what they would prefer for events in order to increase both activity, efficiency, and the feeling of "home" within our town. 1. Summer Concert Series: Enjoy music from 3 different bands, on 3 summer Sundays, July 15, July 29, Aug 12, starting at 5:30 pm. Bring a picnic, your lawn chairs and enjoy music in the heart of Hebron. Located in the field behind Co. #1 Firehouse. 2. July 4th Parade Celebration: An old-fashioned celebration with a twist-everyone will be on wheels! 10:30 am. on Route 66. The parade will start at Hope Church, proceed down Rte. 66 towards Teds, turn around at the Post Office and return. There will also be a reading of the Declaration of Independence on the Old Town Hall steps before the start of the Parade. 3. 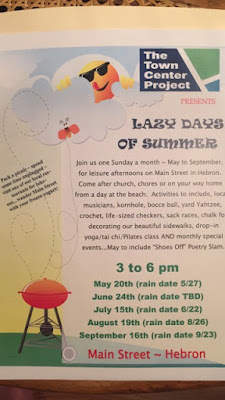 Lazy Sundays of Summer on the Hebron Town Green: Slated for one Sunday a month from May through September (dates and time posted in the image below). The intent is to create a low-key laid back atmosphere along Main Street. The bulk of events are pick up games of kornhole, bocce, crochet, tug a war, potato sack races, yard Yahtzee, a and a life-sized chess and checkers board. Possible activities are sidewalk chalk, hopscotch, tic tac toe, and a drop-in class of yoga, Tai Chi, or Pilates. The committee is also searching for local musicians to and street performers. Each month will have a "main" activity that is intended to draw people to the town green. In May, a local high school student, Melanie Shalayda will be hosting a "Shoes Off" poetry slam on the side lawn on Main Street and will promoted as a "bring your lawn chair, throw down your blanket, and stay awhile" event for all ages. Other months are looking at including an obstacle course or karaoke. Holly Habicht, the president for the Hebron group "Lazy Sundays" says that "the hope is to bring the Hebron community and their friends to the center of town to utilize the beautiful sidewalks, and spend some good, quality time with each other." For more information, please contact Holly Habicht at Daisiesndaffies@sbcglobal.net. 4. Harvest Moon Festival: The harvest Moon Festival will be held on Saturday, October 20th, 2018. The committee plans to have artisans, vendors, family games, pumpkin chuckin', a fun run, and a nighttime pumpkin walk. Right now the committee is in the early stages of planning. For more information, contact the president, Wendy Weingarten at ewwo@comcast.net. 5. Town Wide Tag Sale: The town wide tag sale is scheduled for June 2nd, 2018, rain or shine from 8:30 AM to 2:30 PM. Hebron residents, businesses, and organizations can all participate. People can register to hold a tag sale at their homes or business for a fee of $25 ($30 if after 5/7/18). People can also reserve a table at Town Hall for a fee of $20 ($25 if after 5/7/18). House tag sales will be given a house marker sign for easy tag sale locating and maps with house locations will be distributed throughout town at select locations. To register, you can print out a tag sale registration form the TTCP Facebook page or contact the chair, Emily Turker at emilyturker@gmail.com or 860-559-5554. Registration forms must include a check payable to "The Town Center Project." Registrations must be received by Monday, May 21st in order to be included on the town location map. Please come out and support Hebron, Connecticut with these upcoming events! Feel free to contact the individuals posted if you would like more information. Thank you.